Broccoli thoran or broccoli stir fry with coconut and spices make a very yummy, easy and healthy side dish with rice for lunch or dinner. To make this easy broccoli stir fry recipe vegetarian delicious (broccoli thoran Kerala style recipe), I have used spices and grated coconut, but if you don’t have freshly grated coconut you can use unsweetened shredded coconut in the recipe. We use the spices to add the flavors of this simple, healthy and super easy vegetarian ( vegan too ) recipe. Kerala style thoran recipes uses coconut as one of the main ingredients along with spices and vegetables(or sometimes lentils). Thoran recipes are usually healthy if you don’t add much oil to cook 🙂 Broccoli thoran recipe Kerala style recipe is a vegetarian healthy broccoli stir fry recipe with coconut and spices and this goes great with rice for lunch or dinner. This dry broccoli dish can also be used as a dry broccoli curry for chapathi as this is a yummy side dish for both rice and chapathi. As this is a vegan recipe too, this will make a great side dish for lunch or dinner if you are following a vegetarian or vegan diet, or if you just want to add more healthy greens to your diet for health reasons. This is one of the best clean eating recipes too, as you can see for yourself from the recipe, how healthy this is made. It is easy to make the broccoli stir fry recipe vegetarian or vegan, by adding your favorite spices. 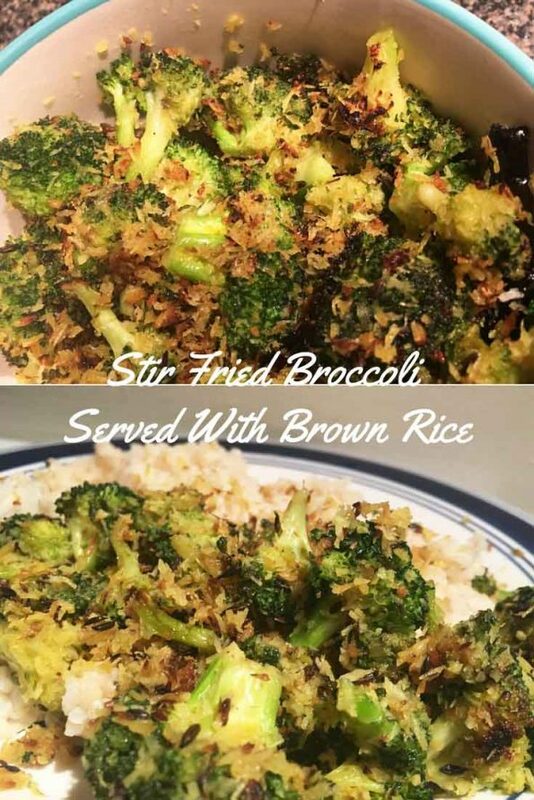 I will add my favorite spices to go with this easy broccoli stir fry recipe in the ingredients section, however, you can also add your own favorite spices and decide which one you likes the best. I strongly recommend not to skip garlic for this simple broccoli recipe, as the garlic add great flavor to it. You can use freshly crushed or grated garlic or you can use dried garlic flakes. If you have garlic at your home, peel the garlic and crush it easily using a good quality garlic ginger press. You can also use dried minced garlic flakes instead of fresh garlic. Broccoli is a fantastic green vegetable and tastes best when stir fried. It has all the crunchiness you need, it is a super food with lot of antioxidants and other nutrients to be included as part of a healthy diet. See how I have used this easy broccoli stir fry recipe to make this healthy and yummy stir fried greens to go with brown rice. If you enjoy them raw, it is really good for you! But you don’t have to always eat raw broccoli, as you can stir fry it with spices for the best flavor. 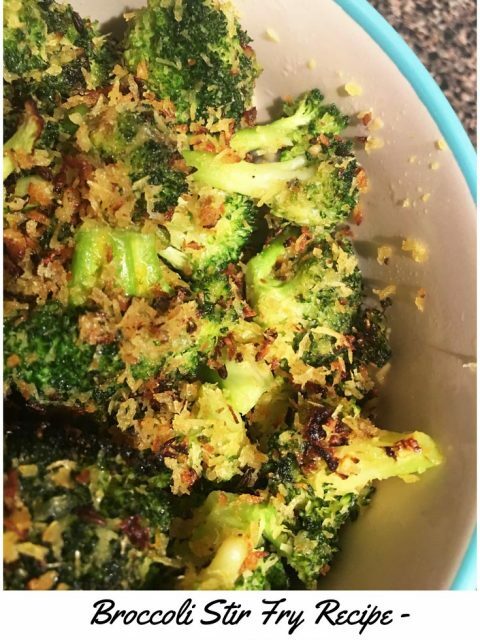 And add the grated coconut (or shredded unsweetened coconut) for the best results, to make this easy broccoli stir fry recipe vegetarian, super easy to make, healthy, exotic and delicious! See how to make this easy broccoli stir fry recipe following this easy and simple broccoli thoran recipe. I suggest you to use a really good wide bottomed skillet or fry pan to make stir fries like this easy broccoli stir fry recipe. It is very important for good stir fries as you really shouldn’t crowd the vegetables in the pan you use. Also, it is important to have a good quality spatula to make the best stir fries. You can use the spatula to easily mix the ingredients together and as a plus you can use them to help with your cooking in many many more recipes. There’s not a single day where I don’t use my spatula for cooking! 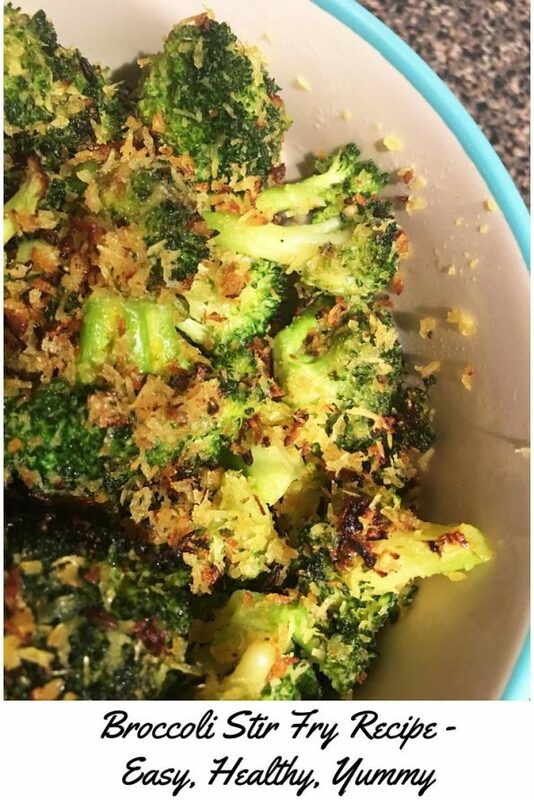 This easy vegetarian/vegan broccoli stir fry recipe with coconut and spices, is super easy to prepare and you can enjoy this as a side dish with brown rice or white rice along with other side dishes. Stir fried broccoli with coconut is also known as broccoli thoran in Kerala, South India. This broccoli stir fry or broccoli thoran also makes a yummy side dish (without gravy) for chapathi or poori. Wash the broccoli, separate the florets. Clean the florets again in fresh water and slice into medium sized pieces if needed (do not make small, as the broccoli tastes good when its not chopped too small). Heat oil in a wide bottomed pan or skillet, and add the cumin seeds. When the cumin seeds starts to splutter, add the red chilies, and fry for few seconds. Now add the broccoli florets and salt and stir fry in high heat for about 2 minutes, stirring in between using a good spatula. Reduce the heat to low and stir fry by letting them cook for about 4 to 5 minutes stirring occasionally. Add the grated coconut and spices - turmeric powder, red chili powder and garam masala powder, gently mix and fry for another two minutes. Simple broccoli stir fry recipe is ready to serve! Enjoy for lunch or dinner with cooked brown rice (or white rice) or quinoa or bread and beans, or you can enjoy this as a simple side dish with chapathi or poori. You may chop the broccoli florets into small pieces if you wish, which will reduce the cooking time even further. I prefer the florets to be used in this way by using the florets as they are or by cutting a bit to make them medium sized, as they are more crunchy in texture that way. You can also add your favorite spices if you wish, some nice additions would be crushed black pepper, curry powder, oregano powder etc. Hope you found this post on easy broccoli stir fry recipe vegetarian or broccoli thoran Kerala style recipe helpful for vegetarian and vegan lunch or dinners!